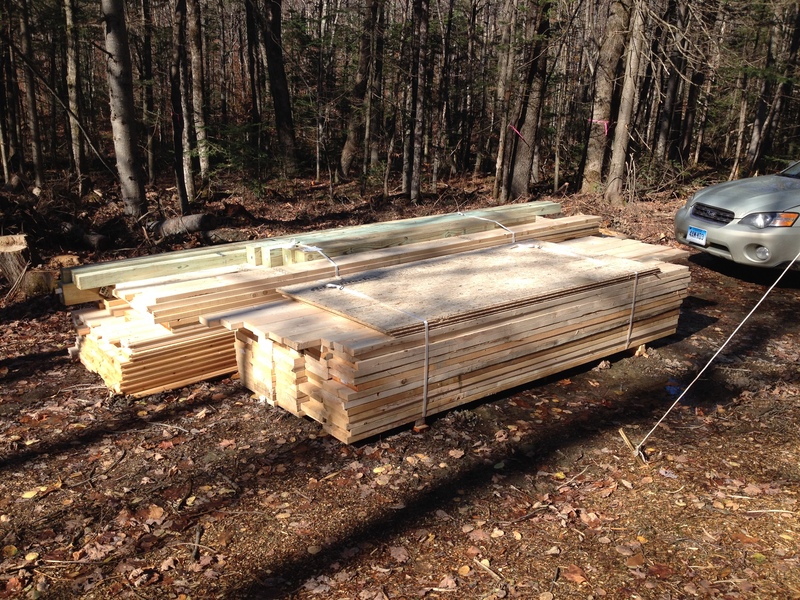 On Friday, W&W Building Supply had delivered our first load of lumber. Pressure-treated posts for our foundation, 2x10s for the rim and joists, 2×6 milled with v-match tongue-and-groove for the flooring. The sweet sight and smell of fresh lumber — just a wonderful thing to even touch it. Sanded smooth, ready to be put to use. So uplifting. As ever, click pictures for larger views. The still grim-looking canvass, finally ready. 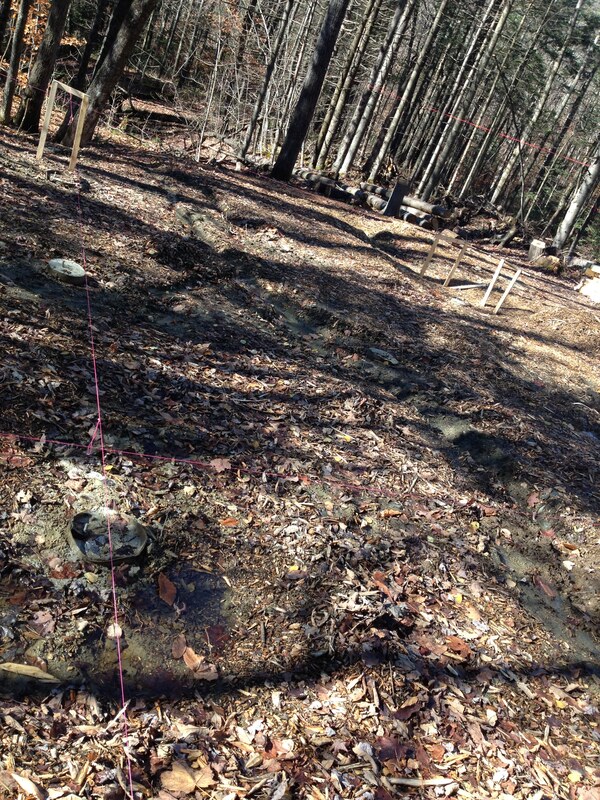 The site still looked a mite swampy, and I hadn’t heard from Donn about a loaner generator. (See the last chapter for the story of our own.) 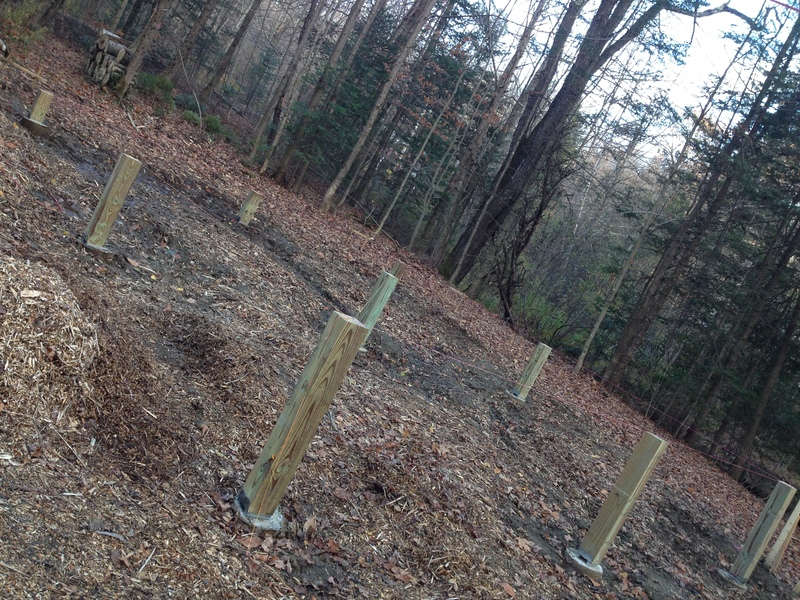 I figured to place the posts, use a level-line to set heights, and cut them off with the chainsaw. You can get a very nice, very straight cut with a chainsaw as long as the chain is sharp and tight. So the first thing I did was get out the saw and, using these beautiful piles as a table, sharpen the chain. It was only as I was getting set to fire it up that I realized a) it needed a full tank of chain oil and b) I’d left the chain oil at home. This is only a set-back – you might not be surprised to learn that people in Vermont also have chainsaws and that therefore many stores in this state also sell chain oil – but the sun is coming up all over my world right now. Just as I was cursing my own stupidity (I do this a lot), Fat City Motor Worx called with the brilliant news that my generator had been fixed. The brutal butcher’s bill: $43.00. I’ve never done cocaine, so I don’t know if you can feel better than that. Power, baby. We’re back in business. Once I’d retrieved the machinery, I set to work on the posts. Remarkably, we hadn’t done too terribly in re-establishing the placement of the pilings in the haste and despair of last week’s muddy mess. For the most part, things were in line. The center-line had drifted a little bit from true, but that is easily accounted for by off-setting the wood. So long as there is a vertical line for the load to travel, we’ll be in good shape. Wood under vertical load, in line with its grain, has a stronger pound-for-pound compression strength than steel. The two-note chord of compressor and generator are the glorious drones on the bagpipes of progress. These are the things you think about when you’re working alone. I also talk to myself. Out loud. Of course, no one can hear me nor could they even if I needed them to. So it’s all for the good. You can probably sense that I’m in a better place this week than last – if you can’t, let me just say that I’m in a better place this week than last. 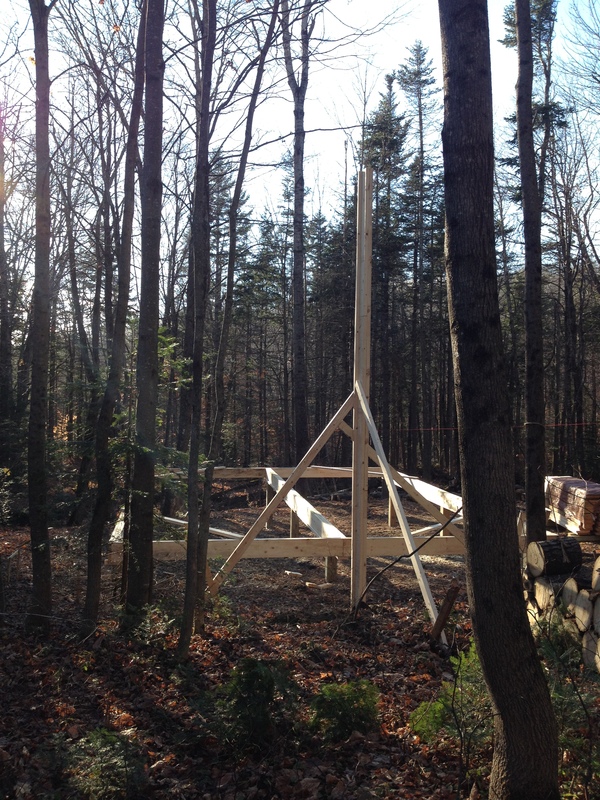 Working with the wood, going up instead of digging down, seeing the outline of the cottage take place all help immensely. The cottage itself has grown slightly. Originally designed as a 24×20 foot box, I had amended that to 26×20 for a bit of extra space. 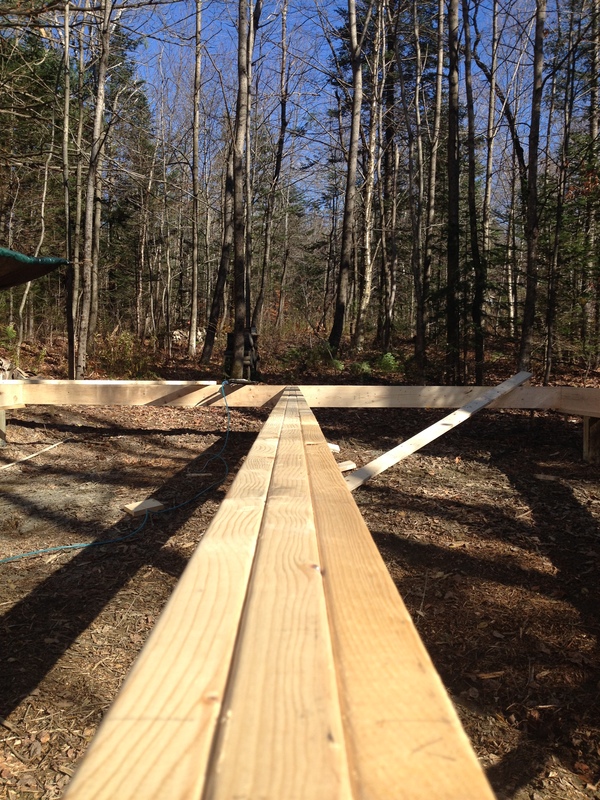 When the lumber arrived, the stringers (the long 2x10s that will together make the three beams of the base framing) were, of course, not 13’ each but 14’ each. So I couldn’t really resist making the structure 28×20. The frame, pre-squaring. It is autumn in New England, so there was rain. But the smell of sawdust was so nice. Feet matter – even one or two of them. Inches matter, actually. You can play with this yourself if you don’t know what I’m talking about. Take the smallest useful room in your house. Subtract one foot in width and see how much tighter everything feels. Another good example is your staircase, if you have one. Measure off six inches and imagine that they’re that much narrower. Or imagine your countertop was a foot shorter, or two. Everything will still work, probably. But in many rooms, the reduced acreage impacts the feel of the space and even the degree of its functionality. Particularly hallways and stairwells – moving through the space is heavily impacted by marginal changes. In large homes, you may not notice. In smaller homes, paying attention to the circulating spaces can yield big dividends in livability and a sense of space. An extra foot in a bedroom means room for a dresser. An extra foot of longitude overall means room for a closet. It can be the difference between a full bath and a corner shower unit, or between two guests and four for dinner. Of course, I can’t move the footings. So I’m cantilevering the ends of the home by about two feet at each end, plus a little bump-out here and there for effect and architectural interest. You’ll see as things come together. 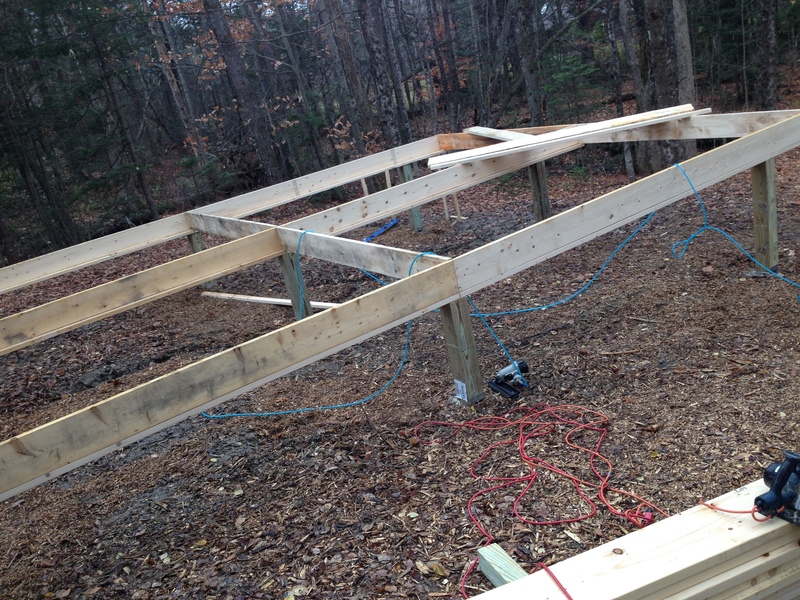 The weekend yielded a squared and leveled frame. 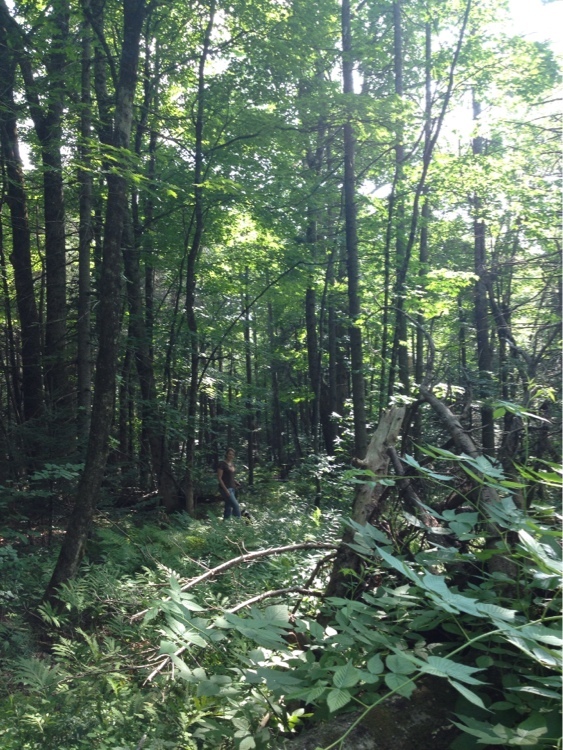 This is a moment of magic that will soon fade: In the forest, we have cleared a space of trees. 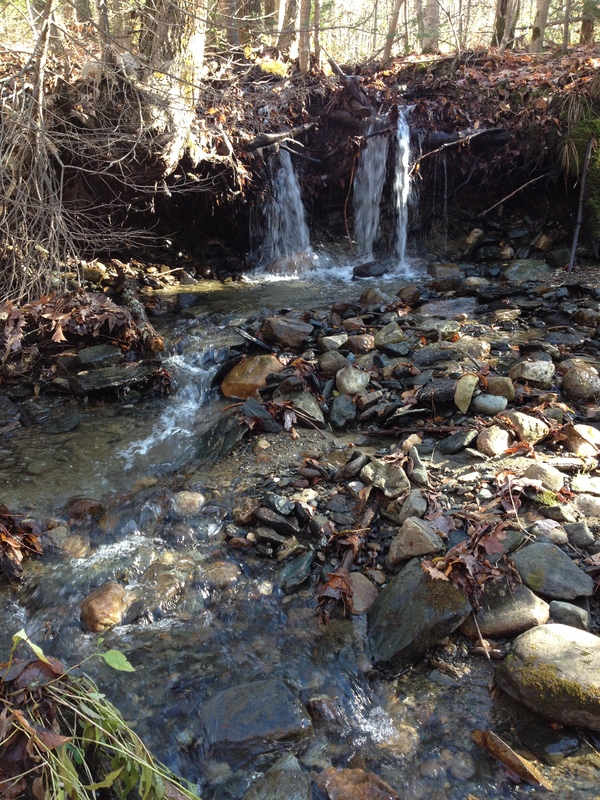 By a small rivulet, we have a sloped and muddy lot. Water tumbles down, trees lean and sway, swales and mounds of alluvial detritus have made banks and channels – nowhere is there a straight or level line. For today and the next few days, we are erecting and perfecting a plane in this place. Its frank hardness is unmistakable – only crystals are as uncompromising. It stands out here, unquestionably made by human hands. A wet autumn showing that everything seeks its lowest level, but that falling can be beautiful. The center stringer — straight in affront to the landscape. As the rest of the building rises and other straight lines and uniform angles arrive to complement, rely upon, and eventually to hide it, the plane will fade from sight. But in this moment, there is a kind of ancient spirituality to it. We have made a flat spot in a broken landscape. It is a proud thing, but also a caution: nothing naturally stands straight. My last task on Monday afternoon was to erect the wand for temporary power. Soon, one of my drones will go quiet as I plug into the grid. I suppose I’ll miss it – for a second or two. This photo was taken about where the next one was. Right angles and straight lines. Then it was off to Boston to visit with two old friends, Mcleod and Lannigan, who are part of my education in building and together form a clique of my small clan. They will be sources of energy and knowledge. One thing all builders do is talk the building. Like editing, things come out in the talk that the drawing doesn’t show the mind at once. We will have a chance to have it out, and catch up, and tighten a weave that time has loosened. Its warp and weft are fixed, though, and the fiber remembers how to clasp itself. My kitchen cabinet, in the kitchen. Lannigan’s. Keep friends, especially the ones you hope to live up to. You can see from the ceiling that none of us can leave well alone. You can see from the form of the photo that I’m still enjoying the pano feature on my phone. I’ll get over it eventually. 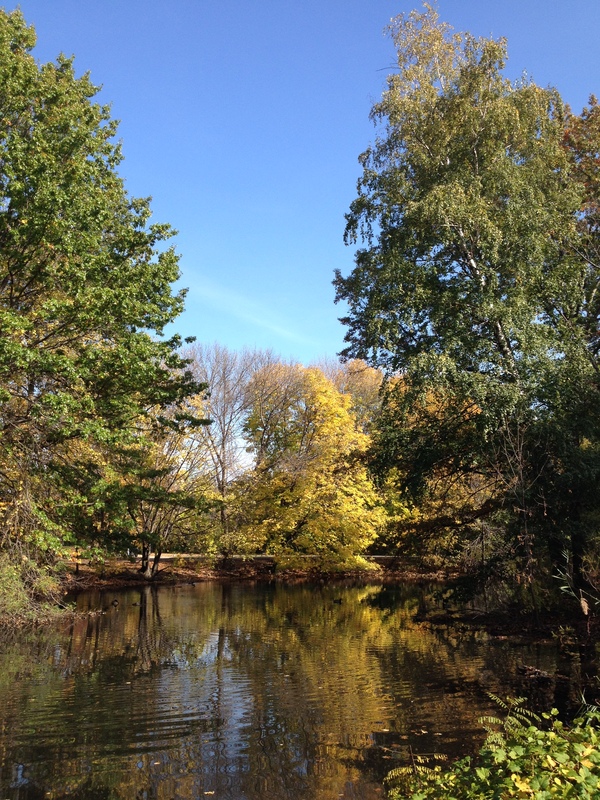 A warm and beautiful late fall day in J-P’s Olmstead Park. So much to say about the great man but I’ll save it for later. 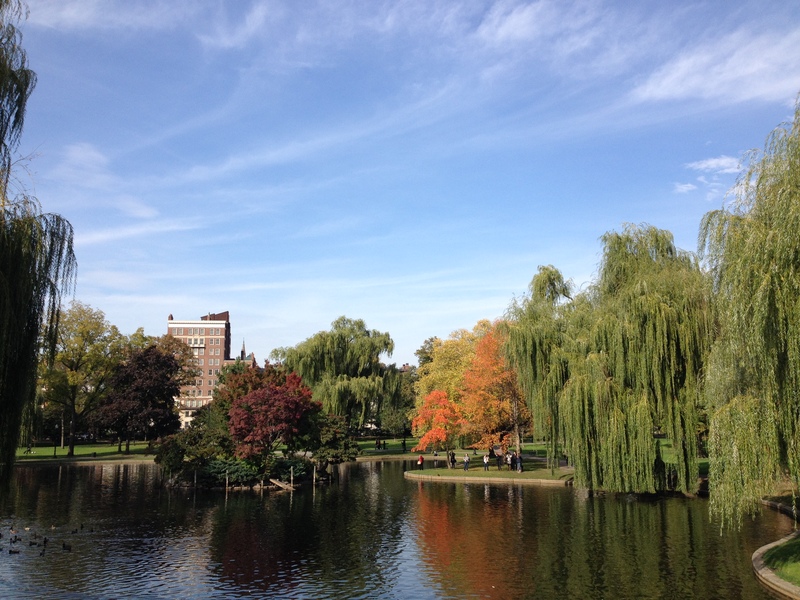 We followed the Emerald Necklace from Jamaica Plain to Back Bay — about a 1:20 leisurely stroll on a perfect day. If you live in a city or when you visit, don’t hesitate to look up. Get over yourself. Who cares if people think you’re a rube — it’s their loss. 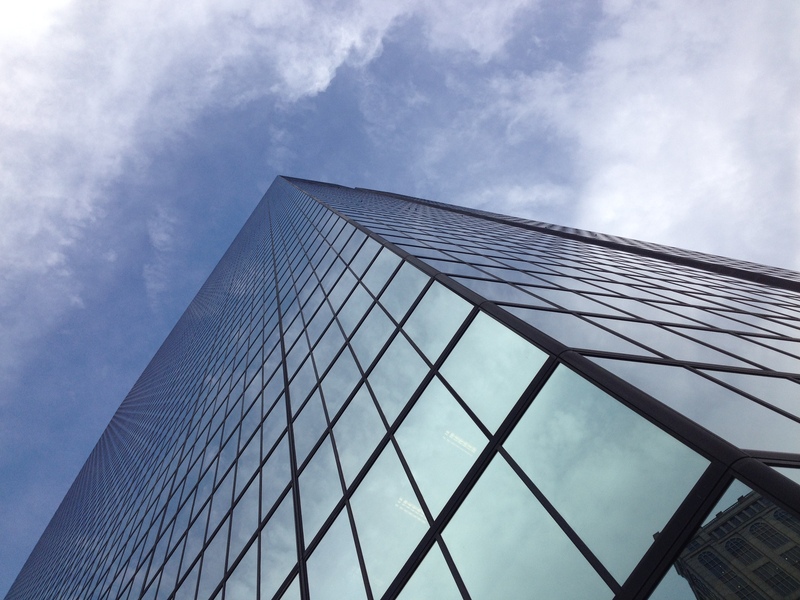 Our towers *should* pull our eyes and minds skyward. Our aims are decidedly more modest, but they are in keeping with our place in the land. Center-right note the stack of lumber that is measured joists waiting to be cut this weekend, then dropped in to take their place in our plane.